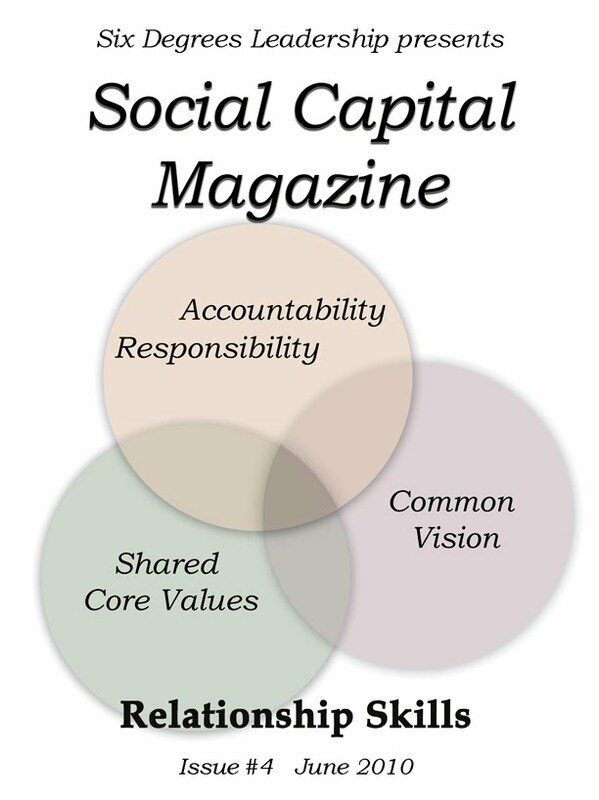 Relationship skills are the cornerstone of social capital. This is a difficult topic to discuss primarily because most people think building a relationship is something that happens merely by spending time with another person. They haven't realized it is a skill that has specific components that can be improved upon to get better in relating to others. So, as you read this, try to open your mind to the idea that there are certain elements that make up effective relationships, and that they are things you can work on deliberately. What we discuss in this chapter is not only relevant for business relationships, but for relationships in every component of your life; social, family, physical, spiritual, financial, political, and even intellectual. We all have relationships, but not all of those relationships are effective. What does it mean to have an effective relationship? You can see the affects of effective relationships in the performance and productivity of people around you. Consider some clear examples. Henry Ford had effective relationships with his engineers. Clearly they were smarter than he, but he was able to bring out the best of them. Chris Carmichael had an effective relationship with his athletes. He was not as good an athlete as the people on his team, but he brought out the best in Lance Armstrong. In this issue’s Voice from the Past, you’ll see that Herriot Tubman also built effective relationships and brought the best out in others. I’m sure you see the theme here. It’s about bringing out the best in others. In each of these cases, both parties got better. As Henry Ford’s engineers got better, they pushed him to get better. As Lance Armstrong got better, Chris Carmichael had to get better. As Herriot Tubman grew her network, she had to get a lot better in relating to more people at a critical level of trust. So the performance and productivity went up for both parties. Look at building relationships like constructing a building. There are many types of buildings that look different and have different functions, but all of them were started with a strong foundation. 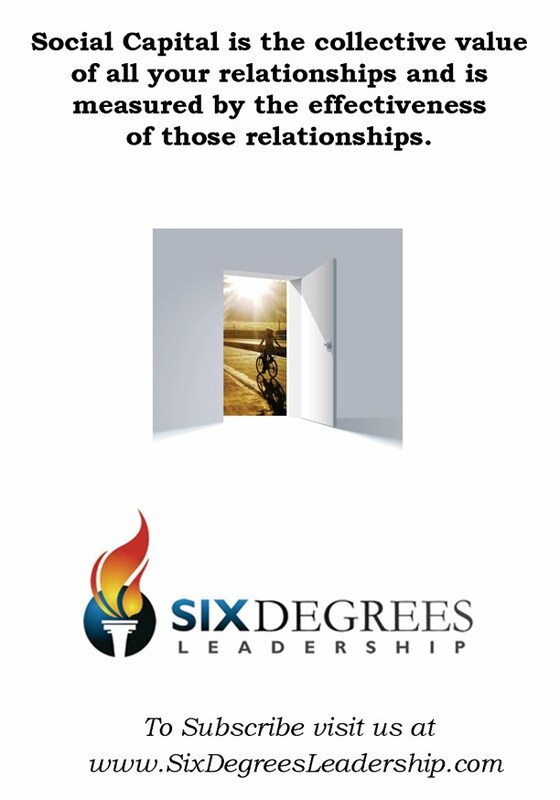 We will lay out the four foundational pieces of building effective relationships in this chapter. However, there are still some elements you need before you can even start the foundation. These are so obvious that you would just assume that someone had them if they were talking about constructing a building. Those elements are Land and Blueprints. You need something solid on which to build the foundation and you need to know what materials to use to build (what type of materials needed for the job are always listed on the blueprints) before you start. In building relationships your land and blueprints are combined into one component, Trust. You need to have trust before you can make any relationship effective. To build a relationship on something solid, there must be trust in each other’s ability to do what needs to be done. Then, you need to make sure the materials with which you’re building can hold up the building. You need to know and trust each other’s integrity. Finally, the blueprints give you the final picture. In relationships, you must have trust in each other’s true desires, trust that there are no hidden agendas. Effective relationships cannot be built without trust. The Leaning Tower of Pisa is the only structure I know of that has been successfully built without these things… Of course I’m not sure how effective the building is other than its ability to attract tourists. To begin establishing trust, we start putting four foundational pieces of effective relationships together. A good synonym for accountability would be answerable. So, to be accountable means to be answerable. In this case we’re talking about being answerable for everything that happens or fails to happen in our business or any part of our lives. We don’t affix blame to anyone else, point fingers or assign fault to others. Instead, we become answerable for everything, whether it was in our control or not, whether it was our fault or not. Being accountable means that you are the owner of your life, never a victim of life. In building effective relationships, not only are you accountable, you expect the other party to have the same level of accountability as well. If you follow this train of thinking to its logical conclusion you’ll find that being accountable makes you tremendously demanding. It is one thing to be accountable for a thing and say, “Yes, I will answer for that.” It is quite another to be responsible for a thing and say, “Yes, I will fix that.” Responsibility means that you will take it as your duty to perform a task. In this case, the task is to solve an issue in a circumstance or within the relationship directly. Of course, no one can go around fixing every little problem in business or in a relationship. But it is up to you to identify what the most significant areas are that need to be focused on, making sure that you are always willing to fix things in those areas. This, of course, makes the assumption that you’ve taken the time to realize what is most significant. (Refer to Shared Core Values). Following this train of thinking to its logical conclusion you’ll find that being responsible makes you tremendously caring. These two areas, accountability and responsibility, make up the art side of effective relationships and leadership. The reason is that you cannot be one or the other. You can’t be caring and not demanding or demanding and not caring. You must be both! There were times when I tried to be tremendously caring by being responsible for everything I physically could. I tried to fix everything as a leader. Of course everyone loved me for that. Once I started to burn out, and things were not getting done (because of the “learned helplessness” culture I had created, where nothing would get done unless I did it), I became more demanding, and there didn’t seem to be any caring going on at all. So, avoid the pendulum, and learn the art of being both caring and demanding at the same time. Core values are things that are often easily overlooked, also. How often do you think about your core values? How often do you talk about them to people with whom you’re building relationships? Do you know what your's are? Although core values are easily overlooked, if they are recognized, they can make a world of difference in your relationships in business, family or anywhere. The most valuable thing shared core values do for your relationships and organizations is create predictable value based culture. For some people, the following example will seem like wishful thinking at best and such a culture couldn’t really exist within an organization. While others who read this example will think it as common place or even feel sorry for anyone who worked in any other type of environment. Imagine a situation where someone had to make a tough decision, either one that will make the relationship more money (morally, legally and ethically), or one that will actually cost money but follows your core values. In an organization with shared core values, if the person made the decision for the money and you brought it to their attention that they have violated a core value, the person would actually thank you for holding them accountable and do whatever they could to rectify the situation. In organizations where there are not shared core values, the money would almost always win out and the only thing that would happen if you raised a point about values would be a fight. A common vision seems pretty obvious when it comes to business but surprisingly many businesses skip this step. You can see it was skipped over in many partnerships that end in a failed business and sworn enemies. Vision casting is an important part of any relationship that you intend to make effective, whether business, family, or any other. The clearer the vision, the more effective the relationships can become. And just like with Core Values, once you’ve cast the vision, you don’t just walk away and never speak of it again. Core values and vision should be common place in conversations in relationships. There must be a common language built around the vision and the goals to accomplish it. Your core values should be the root of that language. To have your vision and core values put in a frame with fancy calligraphy and matting really doesn’t do anyone any good if they actually have to read it to know what it says. Vision casting and core values discussions are not “tasks” to be done, they are a living part of your culture. When you have all of these elements in place, it increases speed of productivity, and decreases cost. It doesn't matter whether you are starting a brand new relationship or are part of an organization that has been around for centuries. You can create and change culture. However, in either case, it will not happen overnight. These processes take time and persistence. The more deep rooted the relationship (as in families), the more difficult the changes, but the more rewarding and fulfilling when you succeed. Most everyone should know the story of the 3 little pigs. If you don’t, Google it, because I am way too lazy to type! Just a few years ago, I had always wanted to take the easy route (the route of least resistance). It always started out very successful, but it always ended up being a failure. And the reason those endeavors failed was because of the lack of doing it right. In today’s microwave society, we want things done NOW! However, because of what has happened recently in the economy, it has forced me to change how I do things. Let me take that back. It was a choice to change how I did things. This is where the 3rd Little Pig concept comes in. We all know the 1st little pig built his house out of straw. And the 2nd little pig built his house out of sticks and twigs, while the 3rd little pig took his time building his house out of Brick! Let’s translate this into a business sense. Let’s use Real Estate as an example for the 1st little pig. A person becomes a Real Estate Agent when the market is smoking hot. Homes are selling like hot cakes. This person does very little to make a whole boat load of money. This person did no marketing, never attended a seminar, never read books, etc. Out of nowhere, the big bad wolf (A.K.A. The Economy) came along… He Huffed and Puffed and blew his house down, wiping out everything he worked for. bought books to read and studied the markets. However, this little pig did not follow through with what he learned in the seminars, classes he took and books that he read. He had great intentions, but the follow through was lacking. So along came the big bad wolf. He Huffed and Puffed and blew his house down (after the 3rd try) and wiped out everything he worked for. On to the 3rd little pig. He, of course, built his home out of brick and mortar. He laid down the bricks, brick by brick, then slapped on a layer of mortar, then brick by brick and so on. 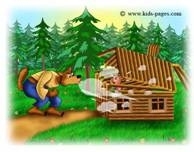 Of course, while he was building his house the other two little pigs were making fun of him. Despite being ridiculed, he kept on keeping on until the home was built. Yes, it did take him a while, but he did it the right way. 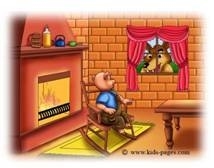 So, here comes the big bad wolf. He huffed and puffed and TRIED to blow the house down… but nothing happened. The wolf tried and tried, and finally gave up. The house stood firm and did not budge! The 3rd little pig is the person who did get into the business and took his time to build it properly. Let me explain. Picture a brick house. Imagine the first layer being laid out. I consider that first layer being the “RELATIONSHIP” course. Each brick in that course represents a concept for building the right relationship. For instance, effective communications, phone calls, handwritten notes, networking events, belly to belly networking or face to face networking. The 2nd layer of bricks would be the "Character" course. Again, each brick represents your character, i.e. Trust, Honesty, Integrity, etc. Make sure this layer of “Character” is good bricks because if not, your house will fall. The 3rd layer of bricks would be the Education layer. This is where the seminars, books, CDs, etc. would come into play. Continuing education is very important to advancing your career. Knowing the market will give you the advantage over the competition. In between each layer is the mortar. The mortar represents the follow up. If there is no follow up, your home will be easily pushed over. One of the most important parts of the home is the roof. The roof is the “WHY/DESIRE” of what you do. Let’s imagine we are in Hawaii looking over a cliff that is 150ft down with the ocean. Imagine that I gave you a nudge and dared you to jump. You would look at me like I was crazy, right? How about for $100. Still no? How about $1000??? $5000??? I didn’t think so. Now, let’s imagine that we dropped a rock down the cliff and watched it splash right into the ocean. Stay with me here… Now, imagine that the rock was a loved one… your child, spouse, a best friend… would you jump now? I’m sure before I even finished my sentence you would have already been in the water trying to save them. You see… we are able to turn ON the “WHY/DESIRE" Switch instantly. Why can’t we do that with something a little less drastic? Let me ask it this way... If you had to raise a million dollars in a week to save a loved one, I bet you would be knocking on every single door to raise that money with no hesitation. I would never ever wish this situation on anyone, but the point I am trying to make is that if the “DESIRE and the WHY” is big enough, we could do anything. With that said, building your Relationship, Character, Education and Desire seems to be very minuet compared to the previous scenarios. If you really think about it, why do we do what we do? We do it to support our families and ourselves. We do it to provide a better life. So in reality, we are doing it to save our family and ourselves, to provide a better life. One last thing, the most important part is the foundation of the home. Simply put, the home has to be built on a solid foundation of Love, Giving and Serving. Anything else would be a foundation of sand. Without this solid foundation, everything you do will eventually crumble. When I think about relationship skills, leveraging influence, accountability, responsibility, common vision and shared values, the first name that comes to my mind from the past is Harriet Tubman. She was an amazing relationship builder and an influential, courageous leader. Harriet was even featured as an example of exemplary leadership in John Maxwell’s book, The 21 Irrefutable Laws of Leadership, under the Law of Respect. Harriet Tubman was born in 1820 or 1821 and was slaving in the fields of the south when she was three years old. She was never educated and could not read or write. She ran away from the plantation in 1849 and made her way to Philadelphia via the Underground Railroad. She was finally a free woman. She is quoted as saying, “I had crossed the line. I was free; but there was not one to welcome me to the land of freedom. I was a stranger in a strange land.” Freedom for Harriet was bitter sweet; she was free, yet alone. She vowed to bring her family out of the south. Harriet made her first trip as the ‘conductor’ (someone who retrieved and guided slaves with the assistance of sympathizers along the way) for the Underground Railroad in 1850. Harriet’s influence and relationship skills commanded respect from slaves who dreamed of gaining their freedom and influential Northern leaders. She spoke at rallies and in homes. In the North, Harriet was called ‘General Tubman’. Many military leaders at the time commented that she was a better officer than most men who commanded the army. Everyone who came in contact with her recognized her strong influence and leadership and felt compelled to follow her. Throughout her life, Harriet worked as a slave, a ‘conductor’, a spy, a housekeeper, a nurse, and an orator. After living a heroic and rewarding life, Harriet Tubman died of pneumonia in 1913. Think about the effectiveness of Harriet’s relationships - from the slaves she took through the Underground Railroad, to the sympathizers who helped her and the leaders who sought her out as a speaker. In addition, picture the loyalties she gained along the way. In ten years of moving people through the Underground Railroad, no one turned her in. I can only imagine that Harriet felt responsible for and accountable to each person she helped because they had common vision and values. We can only hope to have this kind of effectiveness in our relationships during our lifetime.